I am a doctor, corporate executive, entrepreneur, author, and speaker. My wife (Jill), our five-year-old daughter (Joie), and our two-year-old daughter (Jae) live in Tampa Florida and Newport Beach California. Change in Plans: I had intended to start a 6-month "relationship" series with this edition of The BeHappy! Newsletter, designed to improve your relationships significantly. But, since the Summer Olympics just finished a little over a week ago, I decided to postpone the start of that series until the next edition to address a more timely “happiness issue” related to this great event. The relationship series will start with the next edition in October and continue through the New Year. If you rely on unreliable objects for your happiness, you will not end up happy. Studies of Olympic athletes found that bronze medal winners are happier than silver medal winners and sometimes happier than gold medallists. 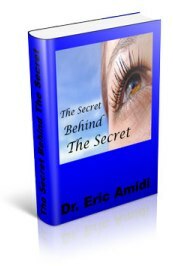 This month’s product will show you how to get anything you want in your life. 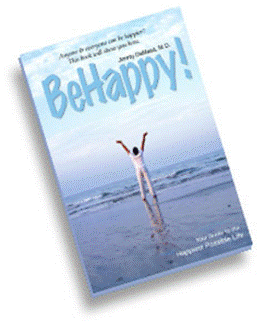 The last edition of The BeHappy! Newsletter in June was about health and, as discussed in that edition, from the perspective of happiness and the entire BeHappy system, there is solid evidence that happiness actually leads to a healthier, longer life. Many research studies prove this. Surely, good health can also help us be happier, but we generally tend to take our health for granted, so the effect on our happiness is not usually very impactful. As part of this concept that happiness actually leads to better health, so too do our beliefs lead us to better health and longevity. That's partly because there is plenty of evidence to support a very strong mind-body connection and that we are essentially "programmed" by our beliefs and rules to affect our health and lifespan. If we “believe” (consciously or subconsciously), for example, that we will get a certain disease or live to a certain age, there will be a much greater chance of that situation becoming a reality than if we believe (truly believe) that we will not get that disease and that we will live much longer. Surely, it’s not guaranteed - and proper nutrition, exercise, and genetics also play a role - but there is plenty of evidence to prove the correlation. So, have you started to change your beliefs as described in the action section of the June edition? Did you read the Deepak Chopra book, Ageless Body, Timeless Mind? Did you start to reprogram your mind using the strategies suggested to slow down your aging process? Are you exercising regularly and eating a healthy, nutritious, disease-fighting diet? Are you also making sure to nourish your mind with happiness – which will bring all this together to make you healthier and live longer? If you’re doing any of these things – even if you’ve just started – I assure you, it can change your health dramatically. If you have not started doing these things, get started now! Please. It’s literally a matter of life and death … and happiness!! As most of you probably know, the 2012 Summer Olympics recently took place in London. I love the Olympics. Ever since I was a young boy I have watched the amazing athletes who make it to this global event perform at the highest level humanly possible. The Olympics raise some interesting questions about happiness. Think about it. The athletes who make it to the Olympics have spent most of their lives focused on their primary goal of getting to this event, which for many is a once-in-a-lifetime opportunity. Just getting there is an incredible accomplishment – and all of these athletes are surely happy just to be there. But, many of these athletes have higher goals and expectations than just to be there. Many are there, not only to compete, but to win. So, from an “emotional” perspective, it can get much more complicated than just being happy to participate. As just mentioned, those who get there have likely devoted most of their lives to their goal. They have spent many, many hours every single day dedicated to their mission, usually enduring significant pain and sacrifice due to the nature of their sport. Then, they get there and they have to compete with the best athletes in the world – and what if they fail to win a gold medal (first place), or even win a medal at all? Can this effect their overall happiness negatively? Take Jordyn Wieber, the World Champion American gymnast, who made it to this year's Olympics and was expected to win a gold medal, but then failed to even advance to the finals and so she was eliminated completely from the possibility of a medal. What a disappointment! She was in tears, and obviously very upset. She was one of the favorites to win gold and now she had no chance to win at all. One announcer said “this will surely live with her forever” – perhaps as a regret or possibly even a lifelong negative memory. Similarly, there are some athletes who are upset, angry and perhaps "unhappy" if they “fail” to win a gold medal (a silver medal - second place - is considered a failure) while there are those many athletes who are ecstatic to just win a bronze medal. The other part of the issue relates to achieving our goals, which should be set high. Many people don't even set goals, and for those who do, many never achieve those goals. 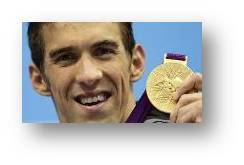 If you watched the Olympics, you probably know that Michael Phelps, the U.S. champion swimmer, now has won more medals than any Olympic athlete in history. He has 22 Olympic medals, 18 of which are gold. Amazing! He is the most successful Olympic athlete of all time. But he would likely never have achieved this result if he didn't have very difficult goals and high expectations for success. Yes, goals are critical to success – and even possibly to maximum happiness in life. So now the big question (to make things even more complicated). Is Michael Phelps happy? This two-fold answer relates to one of the most important first steps in the “Formula” for achieving total happiness in life – which is our own personal Definition of Happiness. Michael Phelps, just like everyone else, must have his own Definition of Happiness well thought out. Almost surely, just the fact that he has won all those medals – and obviously achieved many of his goals - does not guarantee happiness. No one thing does. Money doesn’t. A great relationship doesn’t. Perfect health doesn't. And, winning more Olympic medals than anyone else doesn’t. That's because once we have our definition, we must also have a plan to make sure we make that definition a reality for ourselves throughout our lives. And, everyone’s definition is different. Furthermore, even though most people think they know what would make them happy in life (in other words, they think they know their definition of happiness) most don’t really know it. There are countless examples of famous people who thought a certain level of wealth, fame, and/or success would equate to life happiness. Michael Jackson, John Bellushi, Whitney Houston, and Junior Seau (the former pro football star who recently committed suicide) are a few examples. All died young due, at least partly, to the inner struggles they faced and, I believe, some degree of unhappiness – even though they seemed to “have it all”. So, what is your personal Definition of Happiness? What are your goals and expectations for your life? Well, let’s get to the “action” section to start a process to answer those questions. And if you want more help, please go to BeHappy101.com, get the book, BeHappy!, or take advantage of my free coaching plan by clicking here and I'll help you personally to get started on a plan to make happiness a "habit". Take these actions over the next sixty days and by the time you receive the next edition of the BeHappy! Newsletter (around mid-October), you should be on a path to higher expectations for your life and a better sense of what would make you truly happy. We covered the concept of creating your personal Definition of Happiness in my year-long series which went through "The Happiness Formula". So, the first action to take right now is to go back and review that edition of the newsletter and either reevaluate and revise the Definition of Happiness you created then (if necessary) or, if you didn’t do it at that time, do it now. Also, if you became a subscriber to this newsletter after that edition was published last year in August (2011), go back and read it now and take the actions recommended. This is an essential first step in anyone’s potential to live the happiest possible life. Just click here to go directly to that edition of the newsletter. The next action to take in this process is to assess your life’s goals and expectations in the context of your personal Definition of Happiness. Do you have your life goals written down? Do you have specific expectations for the future, especially as related to your Definition of Happiness and your life’s goals? Goal setting is the subject for a different place, but please look into the process by clicking here if you don’t have specific, written out goals. We will explore these action items in the next edition of the newsletter and, as mentioned at the beginning of this edition, will start a series on improving relationships. A whole new structure will be coming to BeHappy101.com at the end of the summer. I am putting the whole thing together right now (it is a big task) and once the new structure is in place, there will be more free stuff, a simpler navigation system, and the introduction of many new products and services intended to help you live your happiest possible life.